This view shows the side profile of the bag containing a laptop, a mirrorless camera with standard zoom, plus a medium telephoto and a portrait prime lens, as well as a flash unit in the top compartment and a wallet in the ‘lumbar’ compartment. There is still space left for other items, if necessary. As a journalist, I need to travel with both my laptop and a selection of camera gear.Thanks to the reduction in size of cameras and lenses there is less need to rely on a large dedicated camera case. A backpack is one option, along with shoulder-bag/messenger bags and sling bags, which let you access the bag’s contents without having to remove the bag from your person. I have been using a messenger style bag for several years. However, it’s better suited for larger laptops and I’ve recently downsized to a slim 14-inch model. Sling bags look attractive and functional but tend to be smaller and not all can accommodate a laptop, even a relatively small one. So, for now, I’ve decided to look at backpacks. I’ve been sent two for review; the Booq Shock Pro and the Riutbag R15.3. It’s the latter I’m reviewing here. 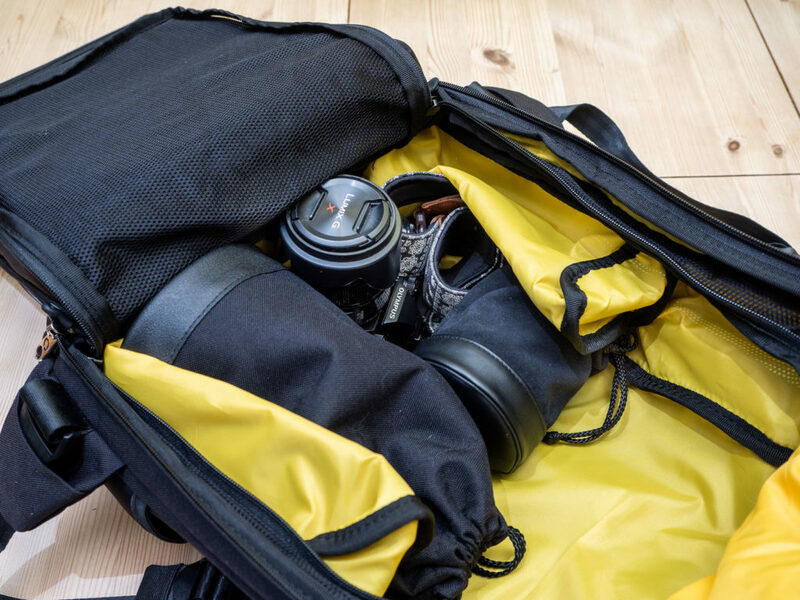 The Riut R15.3 is not designed specifically for photographers although the designer has borrowed a trick used by camera bag makers to improve the visibility of the contents on the bag through the use of a bright yellow internal lining. Riut (pronounced ‘riot’ is a brand set up by UK-based designer, Sarah Giblin. Her story is covered in detail at her company’s website. Basically, she was concerned that traditional backpacks were vulnerable to opportunist theft because when you’re wearing one you can’t see what’s happening behind you and that’s where access to your bag’s contents was. 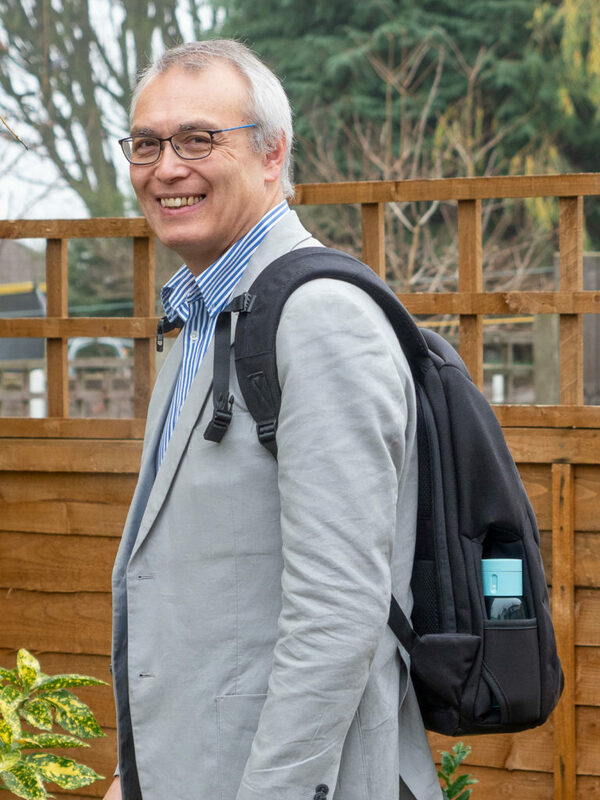 That was back in 2014 and after successful crowd-funding for the original R15 (15-inch laptop, 15 litres of storage space), Giblin has now built a range of laptop backpacks that open from the body-facing side of the bag. This is fundamental to the principle that if access to the backpack is reversed, thieves can’t get at your stuff when you’re wearing your backpack. The larger padded handle across the top appears to provide some added strength and structure to the top of the bag, as well as providing a more comfortable grip when hand-carrying the backpack. The Riut R15.3 has comfortably contoured and padded shoulder straps. The Riutbag R15.3 backpack is almost like two bags, with a multi-pocketed sleeve-like section opening to reveal the main compartment. A slim 14-inch laptop fits nicely. In fact, as the Riutbag 15.3 is designed to accommodate a 15-inch laptop, my 14-inch Acer still fits even when inside its neoprene protective sleeve case. 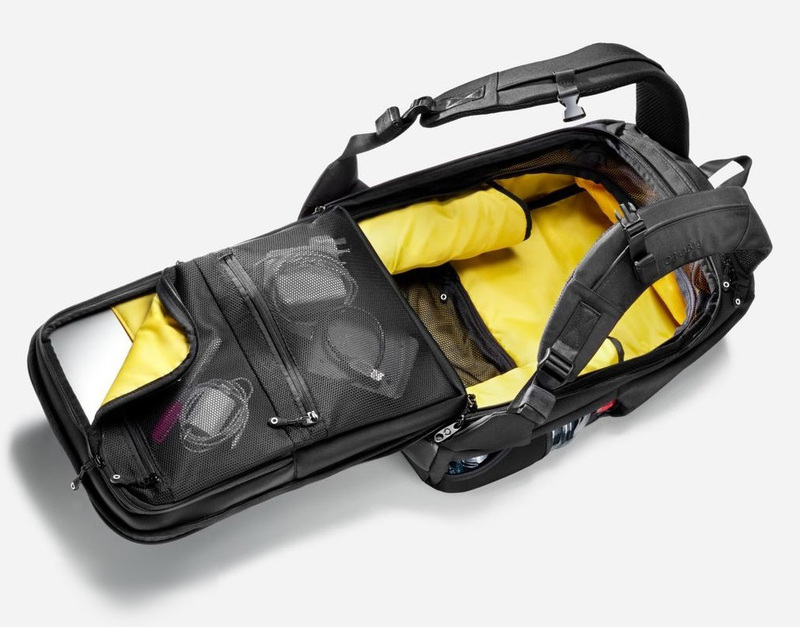 The space for your laptop and other slim items forms the side of the backpack that rests against the wearer's back and folds down when the bag is opened, revealing the rest of the bag's main innards. Don't forget the shoulder straps have to be pushed forward and out of the way for unhindered access. A mesh divider can be zipped in to place to prevent things falling out when opening the backpack. There is a wallet-sized zippered compartment with an elastic mesh sleeve at the base of the backpack that lines up conveniently with the small of the back. There is no chance of a pickpocket getting at it when the backpack is being worn. Here is a close-up of the 'small of the back' compartment. A very handy feature at the top of the bag is another zipped space for accessories. When the backpack is worn the should straps cover most of the opening, which means it's secure. There are bottle pockets on both sides of the bag and, unusually, they utilise space inside the bag rather than extend its width. Larger drinks containers higher than 23cm will stick out somewhat at the top. Smaller drinks bottles, under 2cm high, fit snugly. There are two handles for lifting the Riutbag R15.3 from the top. The Riutbag R15.3 backpack is a slim, tapered, design that looks smaller than its actual capacity. Note the absence of flailing strap-ends. Elastic webbing on the body-facing side of the Riutbag 15.3 backpack means you can stow your backpack onto the retractable handle of a roller suitcase. A chest-strap is standard and it's height-adjustable. here it is near the top. And here is the chest-strap relocated (it imply slides up and down) to a lower position. You can keep your strap-ends neat and tidy thanks to integrated elastic stays. Here the waist strap fixing has been pulled out of its neat pocket built into the base of the shoulder strap. Here you can see the Riutbag R15.3 backpack when worn. There are no tempting zips or pockets, apart from the bottle holders, to entice a thief. A waist strap is an optional extra though the attachments are built-in to the bag, neatly hidden away when not needed. A view from the back demonstrates that the Riutbag R15.3 backpack isn't any wider than it needs to be, even with a drinks bottle. The Riutbag R15.3 backpack is commendably neat and business-like. This view shows the side profile of the bag containing a laptop, a mirrorless camera with standard zoom, plus a medium telephoto and a portrait prime lens, as well as a flash unit in the top compartment and a wallet in the 'lumbar' compartment. There is still space left for other items, if necessary. The Riutbag R15.3 is comfortable and compact as well as worry-free concerning opportunist theft. 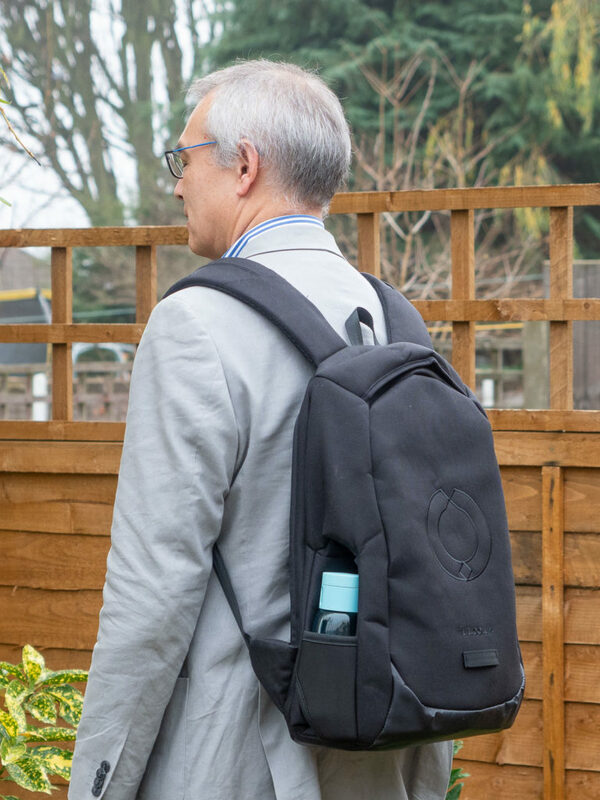 A laptop backpack that could suit photographers? 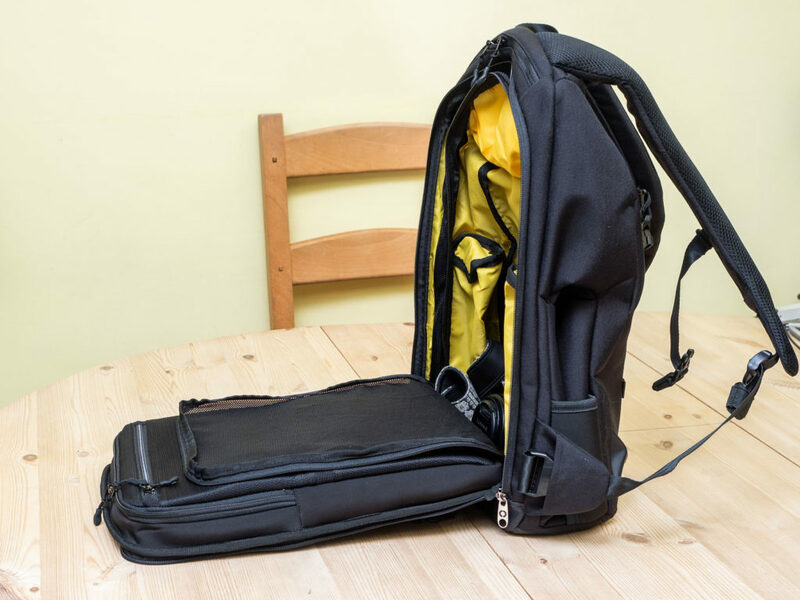 The Riutbag R15.3 backpack is aimed at laptop users who carry other gear as well. My hunch was that this bag could be suitable for my cameras and a selection of lenses. There is certainly enough space. My 14-inch laptop, power supply and mains lead, wallet, phone, phone charger and leads, an Olympus OM-D E-M1 Mark II body, standard zoom, telephoto zoom and a portrait lens, plus accessories, all fitted easily, with some space to spare. One important caveat is that as the R15.3 is not designed specifically for photographers, there are no partitions provided to separate lenses and bodies. My solution to that is to pack the lenses in their pouch cases, which adequately prevents them from damaging each other and the camera. The bag itself is not too heavy but also has adequate impact protection. Don’t forget the shoulder straps have to be pushed forward and out of the way for unhindered access. A neat compartment large enough for a wallet and a few other bits and pieces is located where the bag rests against your lower back. It’s secure and the slight bulge dovetailed nicely with my back; it was certainly comfortable. There are also some gaps to provide some cooling air circulation around your back. At the top, and normally covered by the shoulder straps when the backpack is worn, is another larger zipped compartment that makes use of the smaller and often redundant space at the top of the bag. Inside the R15.3 the main compartment is lined in bright yellow, which helps you find what you are looking for. There are a number of small zipped pockets. The whole bag opens right up with the laptop/cushioned back section, containing the laptop, folding down flat. Access is basically good, only hampered slightly by the drinks bottle pocket linings that intrude on both sides. A zip-up mesh divider prevents the contents of your backpack from falling unceremoniously out when opening the backpack fully. This is where your laptop and/or tablet, etc. go. If you only need your laptop, it can be extracted without opening the case; just unzip the top and slide your laptop out. Nice touches include strap ends that can be easily rolled up and tidied, cleverly hidden fixings for the optional waist-strap and a height-adjustable chest strap. Overall, I liked the Riutbag R15.3 backpack very much. It’s stylish, makes excellent use of space, isn’t too big and bulky and is commendably secure. I’d like to see the production quality improve; there are some wrinkles in the finish here and there. Maybe my sample wasn’t the best. Another concern is that with some budget airlines now charging you to bring bags taller than 40cm into the cabin, the Riutbag R15.3 is about 10cm too tall. Some colour variation would also be nice. On the plus side, the bag looks like it’s built to last and I would be quite happy to own it. The Riut R15.3 backpack is commendably neat and business-like.